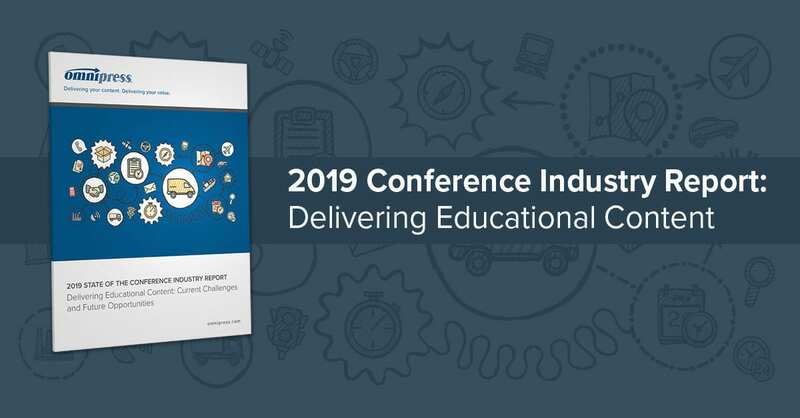 We are excited to announce that our 2019 State of the Conference Industry Report: Delivering Educational Content has just been released! A new year is here and with it comes new challenges and opportunities for association and conference professionals. For the fifth year in a row, Omnipress has tracked the evolution of conference content and the role it plays at an association’s annual event. While educational content continues to provide a significant amount of member value, this year’s report highlights some changes on the horizon: emerging themes, new challenges and increased opportunities for organizations. For instance, this year’s report indicates that meeting planners they are being asked to deliver conference content in more formats than ever before. On average, associations are providing content in 2.6 formats—up from 2.4 in 2018, and 2.1 in 2017. The most noted increase was in the number of respondents who are providing three and even four different content delivery methods for a single conference. The reason? Attendees have indicated this is what they want. Conference demographics are more diverse than ever, with four generations now living concurrently in the workplace. Additionally, there are ways than ever for people to consume content, which is creating a diverse set of preferences that don’t always follow generational stereotypes. While associations look for ways to provide device-agnostic content, budget does come into play—particularly with other internal stakeholders. Few meeting planners have the luxury—nor the bandwidth—to do it all, leading to some tough decisions. The report compiles data from an online survey of 150 association and meeting professionals to understand how organizations use educational content to increase visibility, extend their value and reach new attendees. The purpose of this report is not just to present the data, but to help facilitate a cross-team discussion on how to leverage your greatest asset—education—to advance your mission and achieve strategic goals. Download the free report to read the full results, and use it to spark a conversation within your own organization.